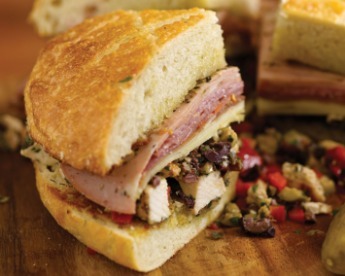 I have always wanted to make one of these Italian muffaletta sandwiches. They look like they can’t fail to be yummy, with the mix of Italian cold meats and cheeses, olives and seasonings on a big loaf of crusty bread. How can that mix fail to be delicious? Well this recipe certainly delivers. It’s full of great flavors that blend together as it rests before serving. Lay the chicken breasts in a shallow dish and pour 1/3 cup of the olive oil over them. Season the chicken with salt and pepper. Grill the chicken breasts, turning 2 or 3 times, for 12 to 15 minutes, until cooked through and an instant-read thermometer inserted in the thickest part registers 165°F. Let cool, then cut into ½-inch pieces. Cut the bread in half crosswise, as if you were slicing a large hamburger bun. Brush the insides with olive oil and grill for 3 to 4 minutes. Begin with the crust side down and turn about halfway through so that the oil-brushed sides are down. Remove from the grill and sprinkle the cut sides with the remaining 2 teaspoons vinegar and the oregano. Spread half of the chicken salad over the bottom half of the loaf. Make sure to include all of the delicious juices. Layer all the cured hams, sausages, and cheeses on top of the salad. Top with the remaining chicken salad. Place the top half of the bread on the sandwich. 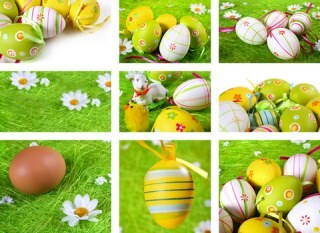 Wrap tightly in plastic and refrigerate for 2 to 3 hours. To serve, slice into 4 wedge-shaped sandwiches. This wonderful grilled chicken muffaletta recipe comes from a wonderful cookbook called Steak with Friends: At Home, with Rick Tramonto . I love this cookbook! It is full of mouth watering recipes for steaks, grilled meats, side dishes, sauces and marinades.